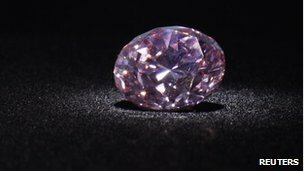 Auctioneers Christie's say that the diamond - the biggest of its kind ever to be sold - was bought by an anonymous telephone bidder. 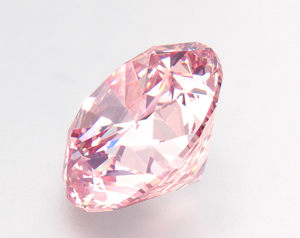 The Martian Pink diamond is extremely rare. Its owner believed it would fetch the best price in Hong Kong. The diamond had been expected to sell for between $8m and $12m (£5m - £7.6m). "The bids were very competitive... there was a lot of excitement... when it finally did come up for sale the buzz in the room was sensational," said Christie's auctioneer Rahul Kadakia. "It comes from Harry Winston, who was so impressed that the Americans had landed on Mars in 1976 that he looked at his inventory and he found a rough diamond which probably could come out as pink," said Francois Curiel, from Christie's jewellery department. The Martian Pink diamond is really gorgeous. I think it was fetched at 135.1 million Hong Kong dollars or US$17.4 million after a 10-minute bidding war.